Pergolas are popularly known across the world for its unique identity with luxurious landscaping. It involves Pillars and Rafters (as beams) as major components. Pergolas with beautiful installations added with seating, green hanging planters and flowers creates real views of nature. 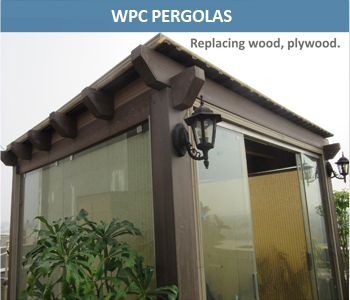 For villas, gardens, colony plots, restaurants, tea posts, road side refreshment areas Pergolas are becoming favorite because of its woody look. Made with wood and polymer with different surfaces like 'sanded' or 'brushed' or 'embossed' pergolas are perfect replacement of conventional wooden structures. It is available in customized wood alike colours. Standard size format comes in 10 ft x 10 ft, with or without benches and with or without WPC Flooring. This format can be multiplied with more such units for longer installations. Pergolas can be designed as glass houses also.